Legally Speaking - Bob Dunlevey of Dunlevey, Mahan + Furry -- Employment Law Developments 2017 in the USA- Law in the USA. This has a link to a downloadable .pdf which is interesting for its short (double-spaced 4 1/3 pages) but excellent discussion of e.g. what the incoming Trump Administration may roll back of the laws and regulations previously supported by the outgoing Obama Administration. Another 1/230,000,000th of a Galactic Orbit. "As the solar year ends, let's try to stop being so parochial". Our comment is, "hear, hear !!" "The galactic year, also known as a cosmic year, is the duration of time required for the Solar System to orbit once around the center of the Milky Way Galaxy. Estimates of the length of one orbit range from 225 to 250 million terrestrial years. The Solar System is traveling at an average speed of 828,000 km/h (230 km/s) or 514,000 mph (143 mi/s) within its trajectory around the galactic center, a speed at which an object could circumnavigate the Earth's equator in 2 minutes and 54 seconds; that speed corresponds to approximately one 1300th of the speed of light." We are, galactically seen, part of a much larger "picture", so to speak. Take a look there for some outstanding insights about life on our planet. The Supreme Court of the United Kingdom began hearings on December 5, 2016 on an appeal from a High Court judgment that only Parliament could trigger Brexit. We see "no legal exit" from the High Court's argumentation and judgment. The BBC News earlier already reported on the judicial process to come at The 11 Supreme Court judges who could rule on UK's Brexit appeal [hat tip to CaryGEE] and more recently reported on the court's Brexit hearings under the misleading headline: Supreme Court Brexit case: 'No need' for MPs to get final say. Well, the case is by no means decided yet and "need" has nothing to do with it. The correct headline should have been: Supreme Court Brexit case: Does UK constitutional law require Parliament to have the final say? The Brexit case puts squarely to the test the system of checks and balances that define the separation of powers among the executive, legislative and judicial branches of government. What the Supreme Court of the United Kingdom is now considering is an appeal from a High Court judgment of 3 November 2016 [The High Court of Justice, Queen's Bench Division, Divisional Court, Neutral Citation Number:  EWHC 2768 (Admin), Case No: CO/3809/2016 and CO/3281/2016] which found that rights conferred by Parliament in 1972 were likely to be affected by Brexit and that only Parliament therefore had the authority to act on the matter of a UK withdrawal from the European Union. [Our] view is reinforced by reference to two constitutional principles. "It is for Parliament, not the executive, to repeal legislation. The constitutional history of this country is the history of the prerogative powers of the Crown being made subject to the overriding powers of the democratically elected legislature as the sovereign body." Parliament having taken the major step of switching on the direct effect of EU law in the national legal systems by passing the ECA 1972 as primary legislation, it is not plausible to suppose that it intended that the Crown should be able by its own unilateral action under its prerogative powers to switch it off again. Moreover, the status of the ECA 1972 as a constitutional statute is such that Parliament is taken to have made it exempt from the operation of the usual doctrine of implied repeal by enactment of later inconsistent legislation: see Thoburn v Sunderland City Council, at -, and section 2(4) of the ECA 1972. It can only be repealed in any respect if Parliament makes it especially clear in the later repealing legislation that this is what it wishes to do. Since in enacting the ECA 1972 as a statute of major constitutional importance Parliament has indicated that it should be exempt from casual implied repeal by Parliament itself, still less can it be thought to be likely that Parliament nonetheless intended that its legal effects could be removed by the Crown through the use of its prerogative powers. The second principle is the well settled limitation on the constitutional understanding that the conduct of international relations is a matter for the Crown in the exercise of its prerogative powers.... It is precisely because the exercise of the Crown’s prerogative powers in the conduct of international relations has no effect in domestic law that the courts accept that this is a field of action left to the Crown and recognise the strength of the understanding that it is not readily to be inferred that Parliament intended to interfere with it. But the justification for a presumption of non-interference with the Crown’s prerogative in the conduct of international affairs is substantially undermined in a case such as this, where the Secretary of State is maintaining that he can through the exercise of the Crown’s prerogative bring about major changes in domestic law. In the very different context of the present case, the question is whether the Crown has power under its prerogative to withdraw from the relevant EU Treaties where such withdrawal will, on the Secretary of State’s argument, have a major effect on the content of domestic law. It is clear that the court in ex p Rees Mogg did not touch on that question. Interpreting the ECA 1972 in the light of the constitutional background referred to above, we consider that it is clear that Parliament intended to legislate by that Act so as to introduce EU law into domestic law (and to create the category (ii) rights) in such a way that this could not be undone by exercise of Crown prerogative power. With the enactment of the ECA 1972, the Crown has no prerogative power to effect a withdrawal from the Community Treaties on whose continued existence the EU law rights introduced into domestic law depend (rights in categories (i) and (iii)) and on whose continued existence the wider rights of British citizens in category (ii) also depend. The Crown therefore has no prerogative power to effect a withdrawal from the relevant Treaties by giving notice under Article 50 of the TEU." Is there a "legal exit" for "Brexit" other than through Parliament? In any case, the Supreme Court of the United Kingdom will decide. For Brexit supporters -- who may rightly worry that the court will determine that only Parliament can "trigger" Brexit -- they should note that it will be a decision not made by the European Union or by any outsiders, but rather very much by one of its own three principal institutions of constitutional democratic government. Take a look again at "home-based" Eleven Supreme Court Justices. That is what checks and balances and the separation of powers is all about. Ultimately, of course, the PEOPLE decide, but the legal processes in place that are required to be followed, must be followed. A referendum can be an important indicator of the wishes of the people, but it has no force of law, and, indeed, is a only a momentary indicator of what people are thinking at the time of that referendum. Given the many negative things that have happened to UK fortunes in the interim, especially on the financial side, it is indeed even likely that yet another referendum on the same question would currently probably give a different end result -- even if the vote were close. There is good reason why democracy is based on representative government, i.e. people who are elected to serve for extended periods of time, rather than on having a direct popular vote on every governmental question. Representative government provides continuity of policy. Direct popular voting on every governmental question would be ephemeral and lead to boundless chaos. One of the most interesting stories currently is the collision of sports and politics on the question of Latvian-invented meldonium. US News carries an AP story reporting that Russian President Vladimir Putin has gone on record as stating that Meldonium is not an athletic-performance-enhancing drug. We posted about this topic previously at LawPundit at Sports Law Pharmaceuticals & the Maria Sharapova Tennis Case: The Latvian Inventor of Meldonium Defends the Safety of the Allegedly Performance-Enhancing Miracle Drug aka Mildronāts, Mildronate, Quaterine, MET-88, THP (not Available in the USA or Germany). The simple fact is that a 20-capsule package of meldonium at 250 mg per capsule is an OTC (over-the-counter) medication that can be purchased without a prescription in pharmacies in Latvia (perhaps in Russia too, we do not know). Meldonium is in our view quite comparable to ubiquitous vitamin and nutritional supplements and has been available for purchase for many years. There is no evidence that taking meldonium somehow magically "enhances" athletic performance. It may make your heart healthier, just as some vitamin or similar supplements, or even certain foods, also claim to do, but that is by no means "drug misuse" of the kind that should be prohibited in athletics. In the interview cited above, Dr. Michael White, who otherwise gives a straightforward, very informative interview, asks why Sharapova, who spends much of her time in the USA, does not take a "comparable" USA-FDA (Food & Drug Administration) approved "heart medication" rather than meldonium. Why should she do that if she has been taking meldonium without side effects for years? Nationalistic provincialism should not mark the pharmaceutical field. As someone who worked for years in the pharmaceutical industry, here is our very personal but we hope instructive take on a further answer to Dr. White's question about what substances we can take. It is all about money. We ourselves will hit the age of 70 this year and occasionally see signs of the wear and tear that advanced maturity can bring, so that we have occasionally taken a modern non-generic prescription-only state-of-the-art angiotensin II receptor blocker for our high blood pressure. It costs about €30 a month when taken in normal dosage and has some potential very undesirable side effects, so we have taken it sparingly. Who needs drug-induced difficulties? Not us. We are a high energy individual, so that when meldonium first came to our attention, it looked to us like an interesting alternative substance that appeared capable of strengthening the heart and had no known side effects, so we obtained meldonium as the product Mildronāts - Grindeks, perfectly legally, prescription-free, and OTC from Latvia, a European Union Member State. We have no qualms about using it in Germany, another EU Member State, which in our view can not prohibit us from using such a medication freely available in the EU, even if the substance itself may not be approved for sale in Germany itself. That would otherwise contradict the "single market" principle. We are here, after all, not dealing with some kind of illegal drug. In our short experience we can report that meldonium seems to have a very positive effective on lowering our high blood pressure and thus far shows no negative side effects whatsoever. There may even be a positive side effect. To our knowledge, no comparable study has been published on humans, and there may be no comparable effect. Who knows. And here is the rub, perhaps answering Dr. Michael White's question above. A package of 20 such 250mg capsules of meldonium costs about €6, so let us say ca. €10 per month if taken as we take them, at one capsule a day, even though 2 are recommended as the normal dosage. That is a cost of ca. two-thirds less than what we would have to pay out of pocket for our non-generic angiotensin II receptor blocker, since insurance covers only cheap generics -- in our experience not always comparably effective. The annual cost is thus $120 instead of $360. Quite a bit of money for an average person. **U.S. Law and Drug Safety: U.S. government officials have stated that individuals who order non-controlled prescription drugs from Canada or other foreign sources (up to a three-month supply) for their own use are not being pursued or prosecuted. However, it is technically not legal for individuals to import most prescription drugs. The U.S. FDA regulates the safety and efficacy of medications sold in U.S. pharmacies. Medications dispensed from outside the U.S. are regulated for safety and efficacy by pharmaceutical/pharmacy regulatory authorities in other countries. Read how regulations may differ by country. Coverage by Insurance: For a drug to be reimbursable from a health reimbursement account or flexible spending account it must be approved for sale in the U.S. and prescribed by a licensed U.S. physician, although drugs which you personally import are typically not reimbursable. If you have pharmacy insurance coverage, you may want to check with your benefits administrator to determine whether drugs ordered from outside the U.S. will be covered or reimbursed." Why is meldonium not available for sale in Western nations? There appears to be a simple explanation. It is not a home-grown product and is priced reasonably. Hence, profits via meldonium would be much lower for indigenous pharmaceutical companies who would have to pay patent royalties on a licensed product sold much more cheaply than their own overly priced, patented, but perhaps nevertheless inferior remedies. We are reminded here of the many actions taken by Apple, Inc. to keep competing, in part, better, smartphones and tablets out of the country. The monopoly principle is the same. Keep competition out. The meldonium controversy is thus conceivably not a medical issue at all, but rather an issue of institutional power, money and monopoly pharmaceutical markets. The USA's FDA and similar institutions elsewhere function as "economic barriers to entry". Even if a drug has been clinically tested and approved elsewhere, every nation persists on making their own studies in determining the licensing of substances, a costly ever-duplicating process paid for by the taxpayers, who have no say in the matter, and who may even be paying top dollar for inferior pharmaceutical substances at their own local pharmacies. When institutions such as the World Anti-Doping Agency (WADA) start blacklisting substances just because they are being used -- blacklisting without any evidence that they do in fact increase athletic performance unfairly, then things are askew in the systems of control that govern competitive sports, as we already know from negative examples at the NCAA, the FIFA and the Olympic movement. Competitive sports are dominated by self-serving monopolies, often abetted by clueless lawmakers and courts who accord such sports organizations special advantages, to which they should not be entitled at all. EVERYONE is "in business". EVERYONE. We note that in what looks to us like a retaliatory measure against the Russians, by the way, that WADA just revoked accreditation of the Moscow Laboratory. It all appears to be part of "the game" of monopoly in sports. The competitive sports world has become -- or perhaps it always has been -- a golden goose for too many organizations and their officers at the cost of the competing athletes. The private WADA is surely no exception in this regard, as its monopolistic practises have come under increasing scrutiny (see the Wikipedia for examples). Moreover, all of these organizations try to expand their powers as much as possible so that they can tell other people what they are supposed to do. Why people have that need for power is something we have never understood. Indeed, it is the athletes who are usually being punished by these "ruling bodies" and not those who run athletics. It is a bizarre system of top-down injustice in which the ruling organizations and institutions control the lives of athletes for their own selfish self-serving and self-sustaining ends. And now perhaps someone in Brussels or Berlin can explain to us why in the alleged "single market" of the European Union, it is virtually impossible to order prescription-free meldonium online, as it is not delivered by Latvian pharmacies outside of the territory of Latvia, as far as we have been able to determine. Mildronate used to be available through Amazon.de. No longer. Its sale is conceivably being blocked on the orders of someone. Moreover, we have found a few links here and there online that seem to point to meldonium "teasers" -- you are warned -- i.e. websites not actually selling meldonium but purporting to do so, and perhaps acting on behalf of other parties to discover who is taking meldonium and who is not. What goes on here as a matter of law, sports and politics? 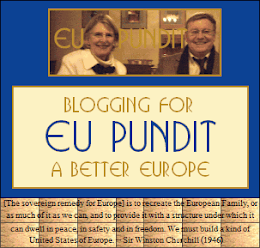 What do we make of the events in Europe? or in the USA? Are Donald Trump and Bernie Sanders inevitable products of an era dominated by a cultural evolution that is labeled post-modernism? Nikil Saval at the New York Times titles his article on the new headquarters "campuses" being planned by Google and Apple as Google and Apple: the High-Tech Hippies of Silicon Valley. Back to the future? Make sure to view the slide show at that link for architectural design prior art. The Google plan reminded this writer of the Eden Project in Cornwall, United Kingdom, with its biomes, its object of sustainability and its emphasis on the importance of transformation. Google is a digital Eden Project in our eyes. Apple's 4-story building structure reflects circular designs that are historically ubiquitous - see "circular design in architecture" in Google image search. Indeed, we are reminded of the shen ring of the Pharaohs, symbol of eternity. Both Google and Apple designs most certainly try to "escape" the limits placed on architecture by square-sided building geometry. Indeed, Frank Gehry's twisted buildings can be viewed as an attempt to do just the same. Squares are out. It is no wonder that Jeb Bush had no chance in the primaries. "Like the rest of Silicon Valley, however, this future is in fact rooted in the past. It comes, transfigured, from the wrecked dreams of communal living, of back-to-the-land utopias, of expanding plastic spheres and geodesic domes that populated the landscape of Northern California around the time (and around the same place) that the first semiconductors were being perfected. This is the world of what a recent exhibit at the Walker Art Center in Minneapolis has termed “Hippie Modernism.”"
As those of us know who grew up in the "flower power" age, especially in California in the late 1960's, the heroic status attached to alternative forms of living and lifestyles in the 60's seemed to disappear as quickly as the "flower power" movement came and went. But did the basic foundations of the "alternative culture" expressed at that time really disappear? Perhaps not. One could argue that the late 1960's were a landmark in cultural evolution, an era marked by the breaking down of viz. questioning of many human customs and taboos that had existed for many generations, but that perhaps were no longer necessary or appropriate to the post-modern age. The weakest and most sensitive elements of society would have "felt" that particular change quite early. That cultural evolution, referred to modernly now as "hippie modernism" at the Walker Art Center, is a term which we find to be too narrow, and we would suggest the perhaps more accurate term "future counterculture". Indeed, one could argue that the counterculture evolution has actually been with us in a process of varied transformation the last nearly 50 years, visible, for example, in alter egos such as digital technology or in post-modernity in art and architecture, or in innumerable other aspects of human society, whether we talk about race, diversity, gender equality, abortion or even LGBT. One need not agree with such developments -- to acknowledge they exist. Indeed, even the emergence of disruptive political candidates such as Donald Trump in the Republican Party and Bernie Sanders in the Democratic Party in the currently ongoing Presidential primary elections may -- perhaps to everyone's astonishment -- well be inevitable expressions of that same "counterculture", as serious challenges to the existing but disappearing mainstream infrastructure, a modernistic edifice succumbing to post-modernity. "Postmodernism is a late-20th-century movement in the arts, architecture, and criticism that was a departure from modernism. Postmodernism articulates that the world is in a state of perpetual incompleteness and permanent unresolve. Postmodernism promotes the notion of pluralism; that there are many ways of knowing, and many truths to a fact. From a postmodern perspective knowledge is articulated from local perspectives, with all its uncertainties, complexity and paradox. Thus knowledge is relational and all realities are woven on local linguistic looms. Postmodernism includes skeptical interpretations of culture, literature, art, philosophy, history, economics, architecture, fiction, and literary criticism. It is often associated with deconstruction and post-structuralism because its usage as a term gained significant popularity at the same time as twentieth-century post-structural thought. The term postmodernism has been applied to a host of movements, mainly in art, music, and literature, that reacted against tendencies in modernism, and are typically marked by revival of historical elements and techniques." When one views the current world as a post-modern development in process, it becomes more understandable and we better comprehend the architectural style of the buildings being planned by Google and Apple. It is no wonder that London has recently entered the age of skyscrapers -- with more to come -- or that the Eiffel Tower is the major landmark of Paris. Art and architecture reflect the power and prestige that accompany the creation of artistic and architectural works. For example, the Pharaohs built the pyramids -- on a massive scale. We moderns build skyscrapers -- on a massive scale. These activities are related in their reflection of prevailing societal norms, beliefs and systems. Is "big" better? Tall constructions are symbols of the "center" of the world, culturally seen, and regardless of claims laid to that title elsewhere in recent years, New York City, "the Big Apple", continues to amaze via its sustained architectural flair. It is still the unrivaled "center" of the modern world. as designed by the architect Rafael Viñoly. Apartment prices start somewhere near $20 million and a penthouse was presold at a reported ca. $100 million. 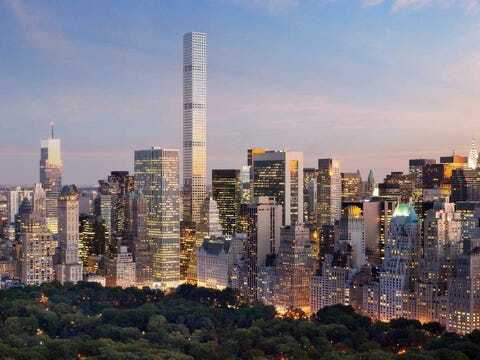 The 432 Park Avenue website starts out with an elevated full screen photo of the building as it towers far above Central Park and the surrounding skyscrapers. 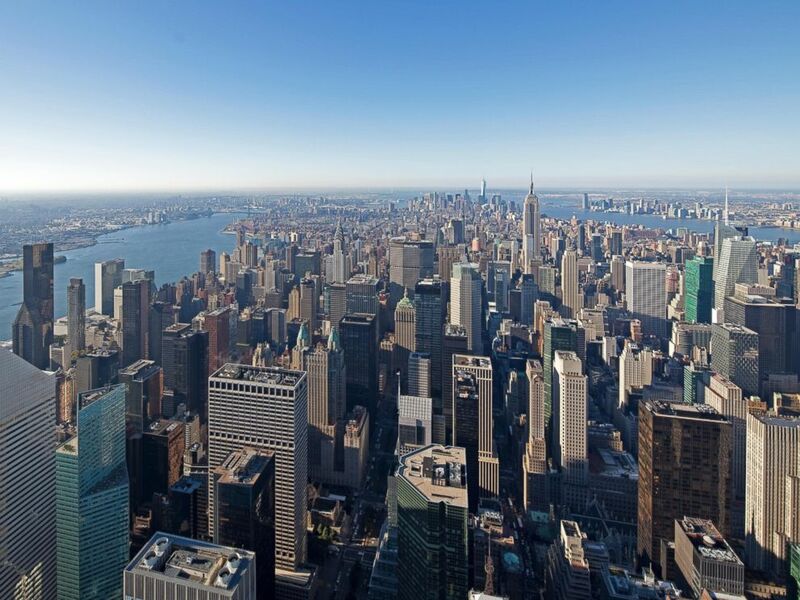 Thereafter, take a look at the 432 Park Avenue website panoramic 360° views, where the viewer can set the height from which the City is viewed. Amazing! See BusinessInsider to get an idea of how tall the building is relative to its surroundings. More such tall slender buildings are planned for the New York City area but right now 432 Park Avenue has its own iconic character. ABC News reported already in 2014 at Inside the Tallest Residential Building in the Western Hemisphere in a story by Alyssa Newcomb. A photo in that ABC News story attracted our personal interest. See the specific image at http://a.abcnews.go.com/images/Technology/HT_tallest_residential_building_4_sk_141014_4x3_992.jpg. That image was taken -- we assume by ABC News -- from 432 Park Avenue looking southward toward the MetLife Building (formerly the PanAm Building, middle), the Empire State Building (somewhat back and to its right), as well as the One World Trade Center building, the tallest skyscraper (with spire) in the Western Hemisphere, seen far in the distance down in the financial district (e.g. near Wall Street) (see https://en.wikipedia.org/wiki/432_Park_Avenue#/media/File:NYCbyPinHt_update.jpg). That ABC News image from 432 Park Avenue also includes 345 Park Avenue, a 44-story building which was completed in 1969 and that occupies a whole city block of Midtown Manhattan in what is called the "Plaza District". Compare its base to the "only" 93-foot width on each side at 432 Park Avenue, an architectural difference of generations in the strength of materials and the demands of more limited space in New York City. By the way, as written at the Wikipedia, the Plaza District is "a term used by Manhattan real estate professionals to denote the most expensive area of midtown from a commercial real estate perspective, lies between 42nd Street and 59th Street, from Third Avenue to Seventh Avenue, about a square kilometer or half a square mile." At the start of the 1970's, 345 Park Avenue, designed by Emery Roth & Sons, (see Richard Roth Sr.), who also designed the World Trade Center, was just about the tallest and largest building in the neighborhood. It is found in the immediate left foreground in that already cited photo taken from 432 Park Avenue as the widest "bright" rectangular building, standing as if in "T-form" just behind the smaller earlier-built black Seagram Building, whose structure was designed by Mies van der Rohe and with some internal aspects designed by Philip Johnson. The bright color of 345 Park Avenue was intended by design to contrast the neighboring Seagram Building. 345 Park Avenue was the former headquarters of the international law firm Paul, Weiss, Rifkind, Wharton and Garrison ("Paul, Weiss et al." viz. "Paul|Weiss"), where the LawPundit was an associate in the early 1970's. This was once also "my residential neighborhood", so it is always a thrill to follow its development. In the illustration below, we have marked the approximate location of our former office in that building with reference to that ABC News photo. Now compare that illustration to the photo at the link ... ABC News photo. To be able to see one's former offices that clearly from high above via the tallest residential building in the Western Hemisphere gives one a special feeling. A marvelous photo looking southward is also found at 432ParkAvenue.com (click on the photo for a larger image), compressing the distance and thus showing some of the distant buildings better and seemingly closer. from which there is a view of 432 Park Avenue in 2015. Please note: This posting was made mostly for the interest of our friends and for those interested in New York City architecture especially. Nothing in this posting constitutes paid or unpaid advertising of any kind and it is not a solicitation for anyone to buy or lease apartments or office space, to attend sports gatherings, to invest money or to avail of financial services, to conduct banking transactions, or to wine and dine. We waive any and all liability for anyone relying in any way upon our text or graphic materials or links. CarTrawler : An Alleged Car Rental Service to AVOID : CarTrawler is NOT a Full Car Rental Company and Potentially a Scam Costing YOUR money : Updated!